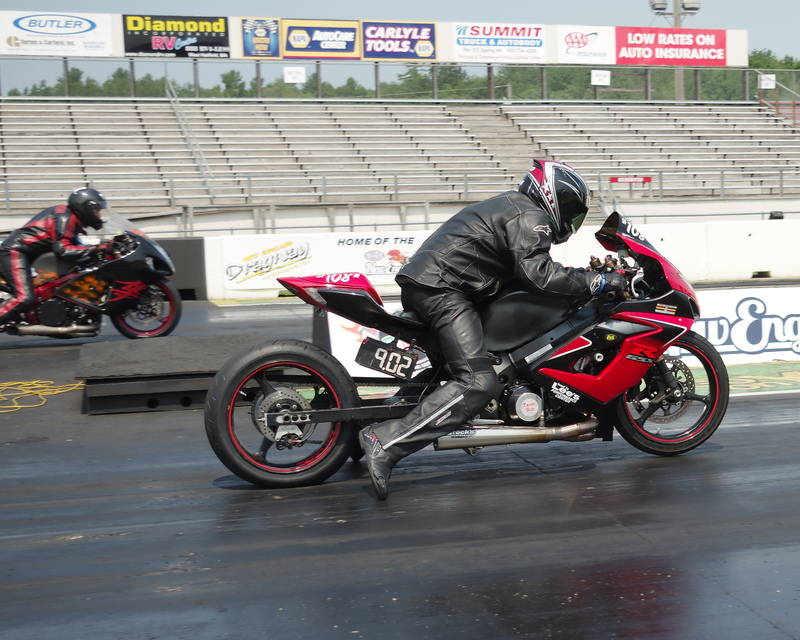 In this the third year of the New England Dragway Motorcycle Masters championship racing, Scott Levasseur, of New Hampshire, has won the event two out of three years. That’s mighty impressive considering a racer has to go into round one of racing stone cold with no warm ups, no test or tuning laps, to advance. He just goes out there and wins in a field of eight racers who are the toughest the track has to offer. 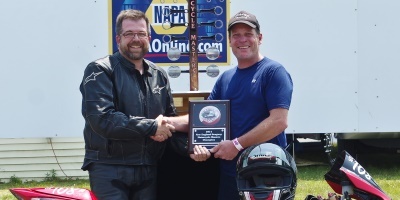 Scott Levasseur (L) receives his second win plaque from Just Wood Flooring sponsor Chris Pratt after once again winning the New England Dragway Motorcycle Masters race for the second time in three years. Tom McCarthy photo. Every year when the Motorcycle Masters race is held at New England Dragway for the N.E.D. faithful racers, two championship points’ racers and their runners up from their respective classes are invited into the seasonal event to race. Then the racers from the season who raced against these racers are tasked to vote for the four top racers from within their ranks to race against the top four point’s racers and go head to head stone cold in round one. To make things more interesting, names are drawn at random for ladder paring in round one and lane choice is settled by a coin toss. Round one is damn tough to survive, but not always. 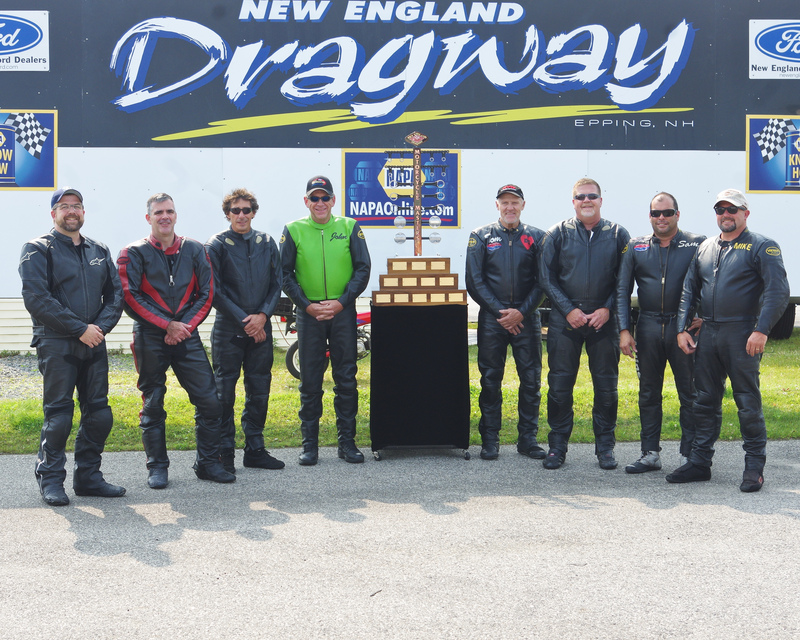 New England Dragway Motorcycle Masters racers comprising the best of the best from 2014 racing action pose with the massive Masters trophy prior to racing on Sunday, July 12th, 2015 at New England Dragway. L-R: Scott Levasseur, Tom Peterson, John Civitarese, John Parenteau, Tom Galligan, Ed Hughes, Sam Hurwitz, Mike Vizzo. Tom McCarthy photo. Scottie drew Mike Vizzo in round one this year in what could have been a tough match up. 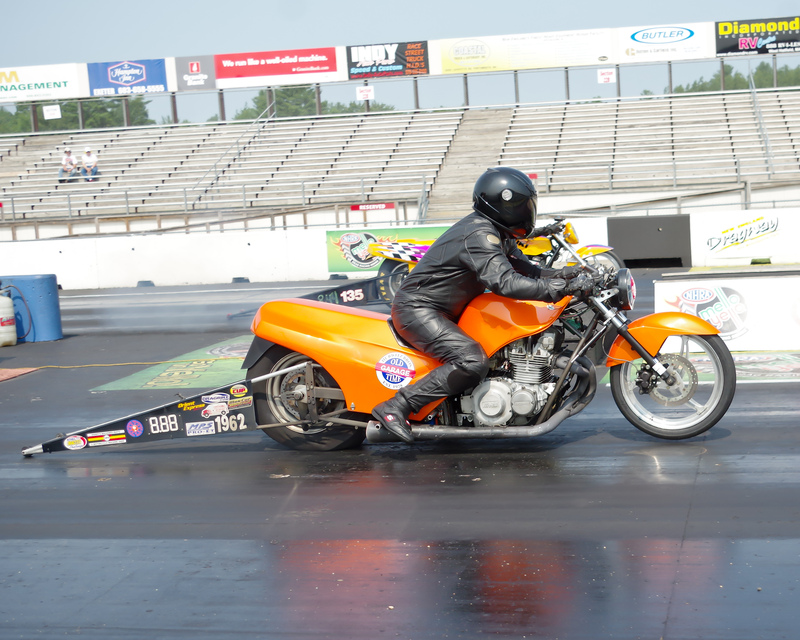 Mike was the 2014 New England Dragway Top Bike champion with a dial of 7.96 to Scott’s 9.04 predictions. Mike is normally deadly on the tree and in Top Bike competition on a Pro Tree he is a racer that can chop the tree when he needs to. But in Motorcycle Masters competition a full tree is used and that played a hand in Mike going red, sending Scottie into the semi-final round. There Scott faced Tom Peterson who is a fellow no-bars racer that was in the final round of the Masters last year. Scott was quick on the tree and Tom knowing he was on a seven second ride had to chase down Scottie, but got loose at mid-track causing him to abort his run. This set up a tough final with Scottie facing Ed Hughes for the final match up. Ed Hughes of Lowell, Mass, (near lane) takes out Sam Hurwitz of Newton Mass on his way to the Masters race final round where he was runner-up to Scott Levasseur. Tom McCarthy photo. Scott was sticking to his 9.04 dial and Ed to his 8.88 dial, was ready to play catch up. Scott was out first on the handi-cap start, Ed sat cocked & loaded awaiting the tree. At the flicker of yellow Ed drilled the tree going for the jugular but was .016 too quick on the reaction sending Scott on to his second Motorcycle Masters win. In the first year of Motorcycle Masters competition, Scott Levasseur defeated Tony Ficher to become the first racer to get his name engraved onto the Stanley Cup of motorcycle drag racing. In the second year of the annual event, Sam Hurwitz defeated Tom Peterson for his place on the trophy. Now, Scott becomes not only the first racer to get his name engraved onto the six foot two inch masterpiece, but he’s also the first racer to have his name engraved onto the trophy more than one time. In as much as there are name tags for 48 winners of the Masters event, it was inevitable someone would repeat, but as fate would have it, Scott Levasseur leads the way! Scott Levasseur, (near lane) gets out first with his 9.02 dial against Tom Peterson who was running on a seven second Hayabusa set for kill. The Busa got loose at mid track sending Scott on to the final round and eventually the winner’s circle. Tom McCarthy photo. 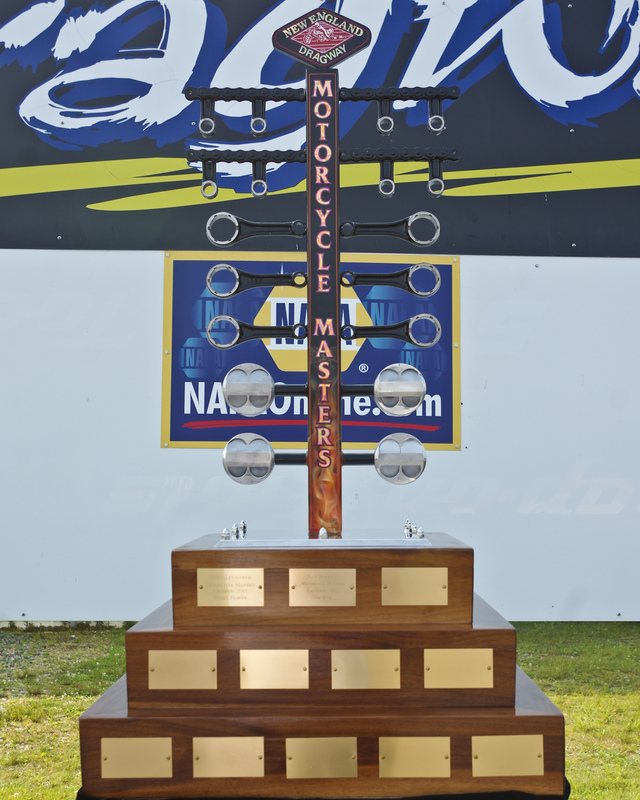 Because the New England Dragway Motorcycle Masters trophy is Mammoth in size, weighing in at 75 pounds, made of welded up drag bike parts and thick walnut planks, it’s not the kind of trophy one takes home to mom. When a racer wins their right to have their name engraved onto the trophy, they don’t go home empty handed. For three years running now, Just Wood Flooring, of Newfields, NH has sponsored a plaque made by City Trophy, of Auburn, Massachusetts, to commemorate the win. 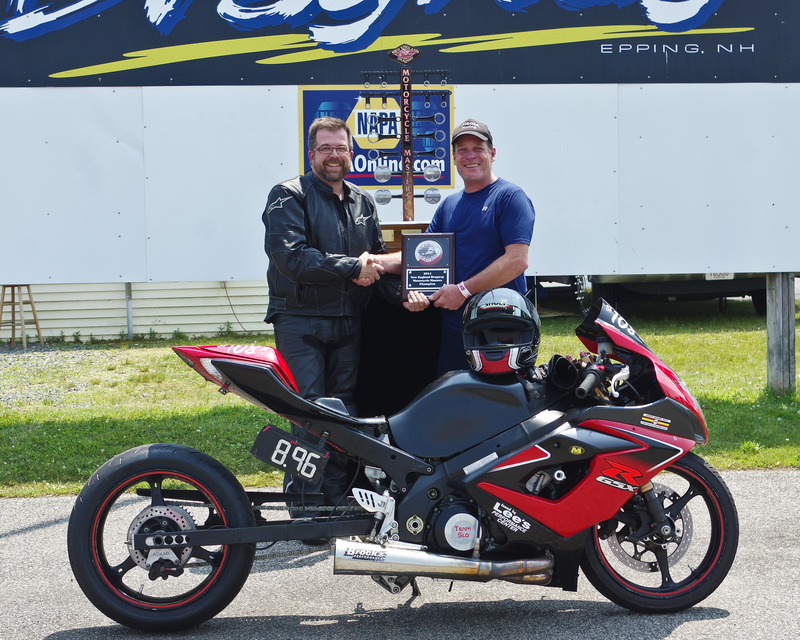 The New England Dragway Motorcycle Masters trophy is quite the work of art. It’s comprised mostly of worn out or broken drag bike parts donated by Harry’s Machined Parts of Northboro, MA. Tom McCarthy photo. This year’s plaque was presented by Chris Pratt, the owner of Just Wood Flooring and in 2016; Mr. Pratt has already announce he’s ready to back the event once again.